CLEAN CAR FAX, 2006 TOYTOA TUNDRA 4 DOOR SR5. 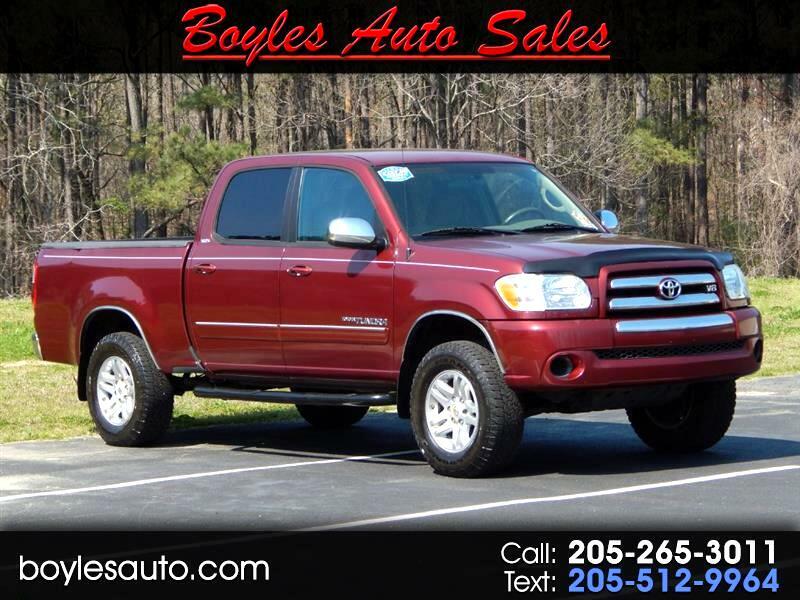 Talk about a fine running and driving Tundra SR5, Boyles Auto Sales in Jasper has got one. Just serviced with fresh oil and filter change, super clean inside and out, Non-Smoker, and more. Check out the inside of this Tundra, with all power locks, window, mirrors, cruise control, good ac/heat, cd player and automatic transmission. Powered by the Proven 4.7L V-8 engine and has more than enough power for towing. Also outside this Tundra you can find the Factory Towing package, aluminum wheels, good Goodyear Wrangler tires, and 4 doors that open. Make the short drive to Boyles Auto and take this Tundra for a test drive, you'll be impressed at the ride and power this truck has. We have bank and credit union financing with super low rates. Call Randy at 205 269 3196, or Scott and Tucker at 205 265 3011. Visit us online at boylesauto.com to see more like this one, or to fill out a credit application for faster financing. Thank You for Looking.